When is Test Mode Output displayed? 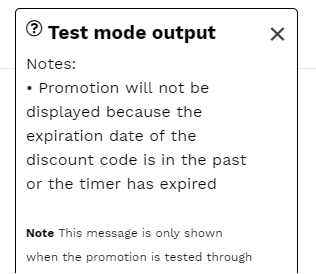 When testing Discount Ninja will display "Test Mode Output" when certain configurations of your promotion cause it not to show the pop-up, notification or price update. This helps you understand if the promotion behaves as you expected. Does the visitor of my store / promotion see this pop-up? No. A visitor will never see this pop-up. It is only displayed when testing the promotion from the Shopify admin. Where is Test Mode Output displayed? "Test Mode Output" is displayed on the top left hand corner of the browser. Why is Test Mode Output not displayed when I copy the URL to a different browser? The Test Mode Output pop-up t is only displayed if the URL contains "&discounturltestmode=1". This is automatically added when you test using one of the Test buttons in Discount Ninja. You can manually add it if you have copied your URL to a different browser. Note: Discount Ninja removes this part of the URL after the promotion is loaded in Test Mode. Discount Ninja does this to avoid that this part of the URL is copied by mistake.